Background: The worldwide demand for natural dyes is nowadays of great interest due to the increased awareness on therapeutic potential and wide range of industrial applications such as in engineering, food, textile, medical and agricultural industries. These environment friendly bioresourse materials pro-duced from non-food crops have revolutionized all industrial sectors especially pharmaceutical and tex-tile industries. Method: Natural dyes are derived from naturally occurring sources such as plants, insects, and minerals without or with least chemical processing. Although, plant based natural dyes are known since time immemorial for dyeing as well as medicinal properties, the structures and protective properties of natural dyes have been recognized only in the recent past. 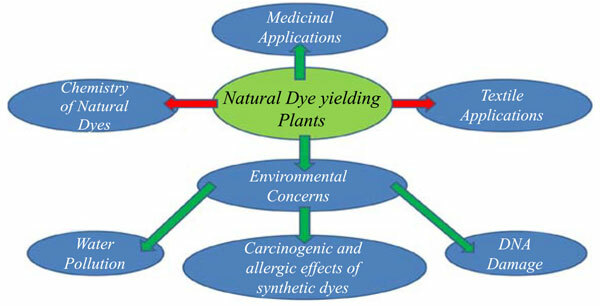 The present review, describes the detailed information about basic chemistry of the major pigments, their medicinal importance and textile applications of naturally occurring dye yielding plants, which are helpful for further development of pharmaceutical formulations and development of value added textile materials. Result: Comparative environmental impact analysis is presented, highlighting the ecofriendliness of natural dyes and adverse ecological concerns of presently used synthetic colorants. Natural dyes, pigments, medicinal value, antimicrobial, textile application, color.